are paraded through the streets on festival days. This one takes place in Nakamozu, Sakai City, Osaka. 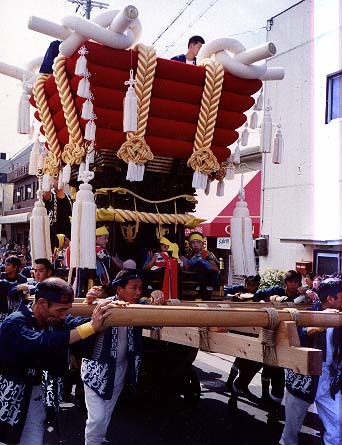 Mikoshi, kamisama, shrine, neighborhood, carry, walk, celebrate, heavy, men, boys, bells, ring, crowd, bustling, happi, zubon, blue, white, yellow, birds (the Mozu), festival.